Well I tried to take photos of my whole collection and couldn't. I think that may mean I have too many, but I love Santas and snowmen. I like a variety of styles, but especially like hand-made ones, either that I have made myself or have bought at craft fairs. Here are some of my snowmen lining the top of my entertainment center. 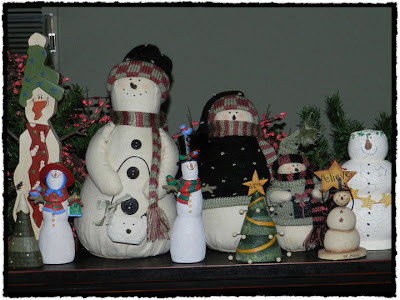 The resin snowmen on the left I painted myself. 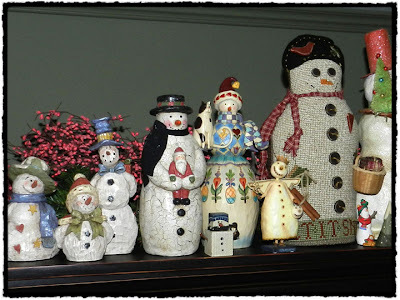 The large snowman on the left is a counted cross-stitch 3D figure that I made ages ago (I only did the cross-stitch, I had someone do the 3D construction). 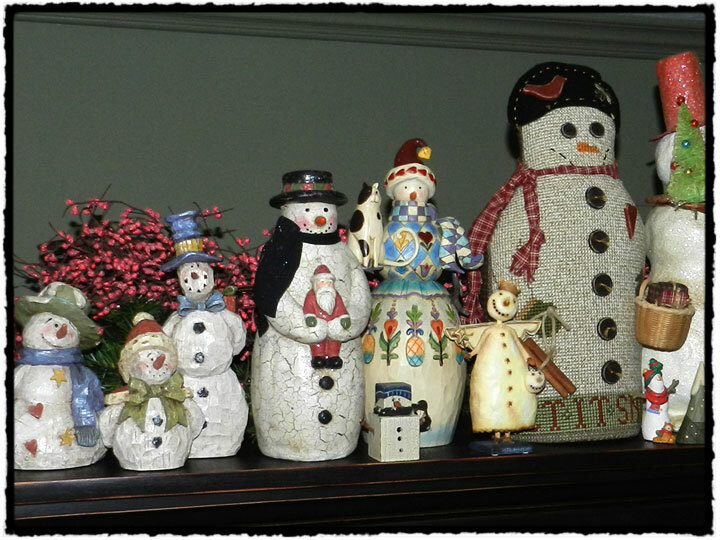 The snowman on the left, with the kookie tie is a wood cutout that I made at one point when I was into folk art painting. I made a bunch of different ornaments and figurines, but sold most of them. Of course I never made anymore, so I think only have two left. 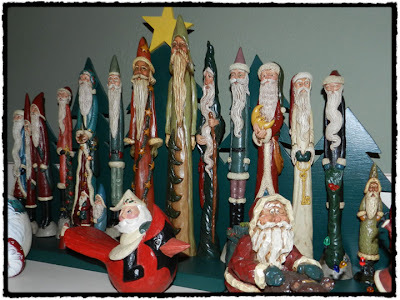 All of the pencil Santas I painted myself, back in the day when you could buy unpainted resin figurines. I used to add a few every year to my collection, but probably haven't painted a new one in 10 years. I had my dad make me the ledge to display them on and it is full now, so I guess it is good I haven't made any more. 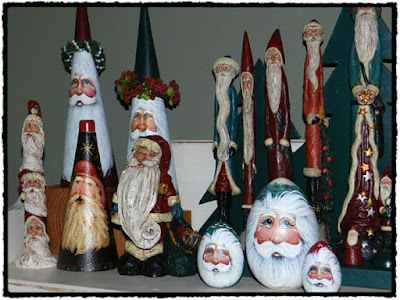 The Santa faces painted on the cones and eggs I bought over a number of years from a women who had a booth at a pumpkin fest in a tiny town near my home town. My mom has a bunch of them too, as well as some plates and other items she had painted on. A couple years ago we weren't able to go and the women was so worried that something had happened to us that she emailed my mom to make sure we were OK. I guess we were good customers. I should try to take a photo of my mom's collection. She makes me look like an amateur.